Cheese making is an artisan craft that can be a beloved hobby, a business, or both. With hundreds of varieties of cheese around the world, recipes and possibilities are endless. Skilled cheese makers refine each step in the process to achieve consistent and delicious results. The cheese making process begins with the addition of microorganisms, referred to as “starter cultures,” to a dairy product such as milk. The bacteria in the starter cultures consume the sugar (lactose) in the milk and produce a byproduct (lactic acid) during a process called fermentation. Lactic acid production begins the process of coagulation, by which the starting liquid begins to solidify. Cheese makers often aid and expedite this process through the addition of the enzyme rennet to the fermenting mixture. When coagulation has produced the ideal mixture consistency, the process continues with cutting. 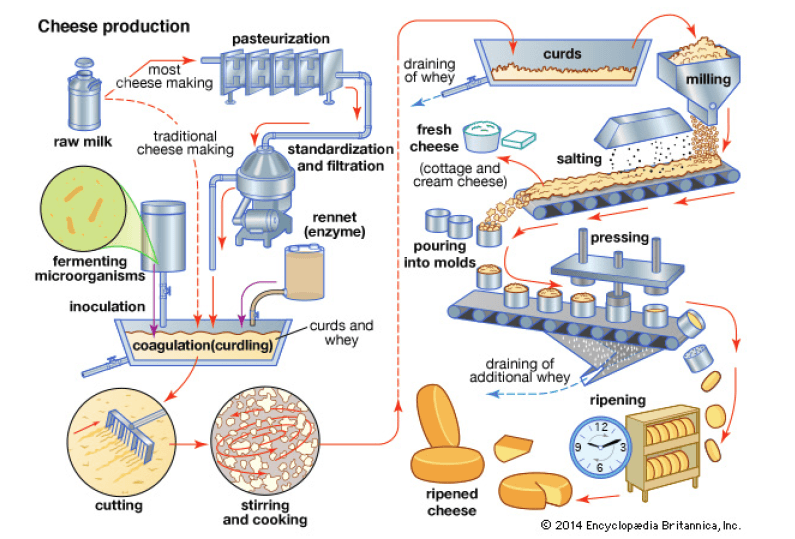 Cutting is a mechanical process that encourages the solid element (curds)—which ultimately become the cheese—to separate from the liquid (whey). After cutting, the mixture is cooked and stirred, causing additional expulsion of whey from the curds. To properly execute the cheese making process and achieve the desired flavor and texture of the product, it can be useful to monitor temperature and pH. These measurements provide insight into the cheese making process, informing the cheese maker on how to adjust for optimal results. For example, cheese makers adjust the temperature of the milk and the type and amount of starter culture added to control the amount of lactic acid produced by fermentation. This helps guarantee that the desired taste and texture of cheese is produced. Measuring pH allows cheese makers to monitor lactic acid levels, because lactic acid decreases the pH of the mixture. Many cheese recipes advise proceeding to a subsequent process step, such as cutting, only when a certain pH level is reached. Most cheese making processes occur at a pH between 5.1 and 5.9, which is slightly acidic according to the pH scale, which ranges from 0-14. Monitoring pH provides the information necessary to properly follow more advanced recipes, or to ensure that your own favorite cheeses come out perfect every time. The simplest way to measure pH throughout the cheese making process is by using an electronic pH meter. With the Sensorex SAM-1 Smart Aqua Meter, cheese makers can now turn any smart device into an electronic pH and temperature meter by simply plugging the SAM-1 into the headphone jack. Cheese makers can use the SAM-1 to obtain quick and accurate pH measurements by inserting the sensor probe into the liquid mixture or solid cheese they would like to test. The SAM-1 is compatible with the Sensorex S2900C/SAM Smart pH sensor, designed for testing the pH of liquids. It is also compatible with the S1750CD/SAM Smart Spear Tip Sensor, which is designed with a rugged conical tip for insertion into semi-solids like cheeses or meats. The range of probe offerings allows cheese makers to monitor their product at any stage of the process, from inoculation with starter culture to aging of the solid cheese. Best of all, calibrating and switching between probes is effortless, as the SAM-1 automatically recognizes the sensor that is plugged in and loads the appropriate calibration data. Use the SAM-1 with any smart device by downloading the free SAM-1 app, which displays temperature and pH readings gathered by the sensor. The app also allows users to store data points along with time, date, location, and comments – perfect for keeping track of the conditions that produced that perfect batch of cheese. Share data with friends and colleagues by storing readings in exportable CSV files or sending by email. The SAM-1 provides the accuracy of an electronic pH sensor with the convenience of your iPhone – the perfect solution for the cheese maker’s kitchen. Do you have experience using pH measurements for cheese making? Tell us about it in the comments!